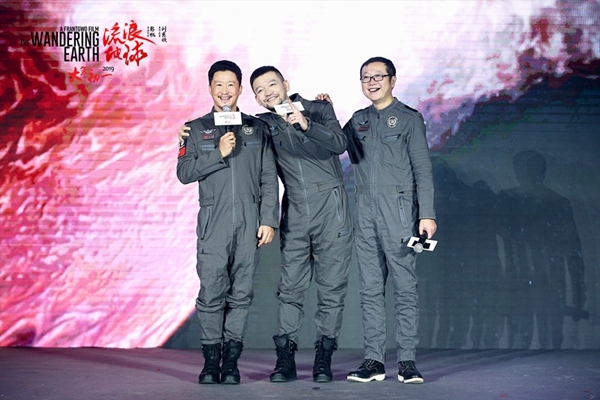 The interstellar sci-fi spectacular "The Wandering Earth" held its premiere in Beijing on Monday and received rave reviews from the audience, signaling that the film may become China's first breakout sci-fi blockbuster film. 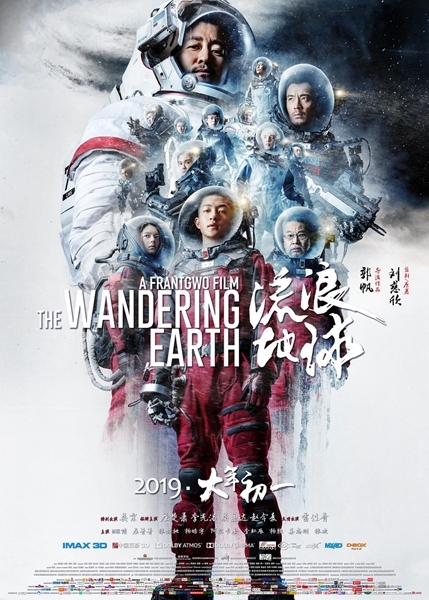 "The Wandering Earth, " is based on a story by China's Galaxy Award winning author Liu Cixin, who is best known for "The Three-Body Problem" and its sequels. The Galaxy Award is China's most prestigious literary science fiction award. The cinematic adaptation was initiated in 2014 with an announced budget of US$50 million. The film is set in a future in which the sun is dying out and exploding. To avoid extinction, people from all around the world built giant planet thrusters to move Earth out of its current orbit and to a new star system in a 2500-year odyssey journey. The film centers around the Earth's close flyby with Jupiter, which poses a grave risk of collision due to the giant gas planet's strong gravitation pull. 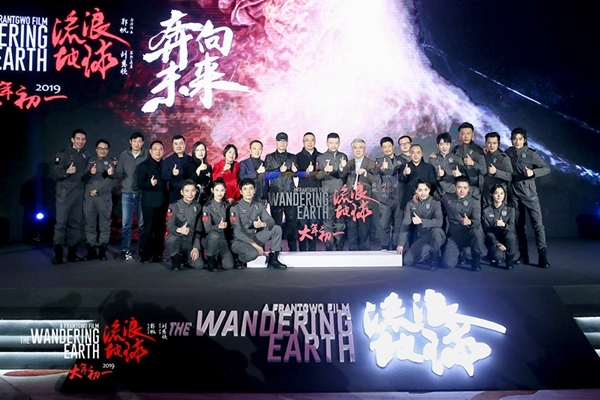 At the premiere, Liu Cixin, also the film's producer, praised the production: "For the first time, 'The Wandering Earth' shows the Chinese people's feelings toward their homeland on a galactic scale, and my soul was shaken by it. I hope many people can feel the charm of Chinese science fiction and the grandeur of this film." For a sci-fi production of this scale, the visual effects had to be of a high quality. Luckily, the film achieves a Hollywood caliber of special effects thanks to the work of many top domestic and international special effects companies, including Weta Workshop, Base FX and More VFX. Director Frant Gwo said the most difficult part of producing this film in China was not due to technology, but trust. He had to overcome skepticism from investors on whether China had the necessary technologies and talent to make a sci-fi film of this caliber. Before filming commenced, Gwo and his team spent 8 months shaping an imagined timeline of events over the next 100 years, with 3,000 pages of conceptual designs. After more teams got involved, they produced another 8,000 pages of storyboard designs and made over 10,000 props. Once filming began, around 7,000 people had joined the crew. The director even invited four scientists from the Chinese Academy of Sciences (CAS) to act as consultants. Gwo's unrelenting passion to make the film happen despite the difficulties inspired many. The best example is Wu Jing, the renowned director and actor, known for "Wolf Warrior" and "Wolf Warrior 2," -- the latter is the highest grossing Chinese film of all time earning US$874 million at box office. He was initially invited to star in a cameo role. However, Wu later found out the director had cast him into a leading role. When he discovered that the film production team lacked enough funds to complete the project, he decided to put his own investment into it and even gave up his remuneration to help cut budget expenses. "We fought and worked very hard to make our own sci-fi blockbuster, and I will never regret," Wu said at the premiere, "At the same time, I participated in the film because I also want to give my son a gift, and plant a seed of imagination into him as well as many other children and young people." Their efforts eventually attracted more than two dozen film investors including giants like Beijing Culture, Alibaba Pictures and Tencent Pictures, besides China Film Group. China Film Group Corporation announced in 2014 that they plan to adapt three of Liu Cixin's science fiction novels: "The Wandering Earth," "The Era of the Supernova," and "Micro Era." Other film studios have also announced plans to adapt Liu's other works including "The Rural Teacher" and his Hugo Award-winning "Three Body" trilogy. 2019 is looking to be a breakout year for Chinese sci-fi blockbusters. "Crazy Alien", itself an adaption of "The Rural Teacher", directed by Ning Hao, will hit Chinese screens on the same day as the "The Wandering Earth" on Feb. 5. Later in the year, other highly anticipated Chinese sci-fi films such as Teng Huatao's "Shanghai Fortress"; Lu Yang's "Assassin in Red"; Law Chi-leung and Yuen Fai Ng's "Virtus"; as well as Zhang Xiaobei's "Pathfinder" will also be released. "2019 could be remembered as year zero of Chinese science fiction blockbusters. It is not just about one successful movie, but about the emergence of multiple films," director Gwo said. The interstellar sci-fi spectacular "The Wandering Earth" held its premiere in Beijing on Monday and received rave reviews from the audience, signaling that the film may become China’s first breakout sci-fi blockbuster film.